The Office of Fair Trading is set to undertake a review of barriers to entry, expansion and exit in the retail banking sector according to Money Marketing magazine. For the full article, visit the Money Marketing website. 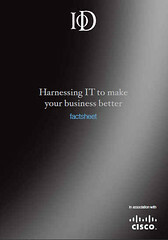 The first in a series of new factsheets from the Institute of Directors in association with Cisco provides businesses with simple advice on creating an IT strategy that will make their companies more efficient, more productive and more profitable. Click on the image above to download. If you have any feedback you would like to share, please contact us.